Save the Date for The World's Largest Golf Outing! Mark Your Calendars for Monday,August 3rd! 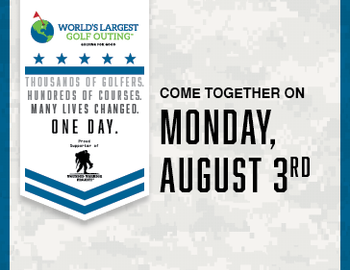 Rob Roy will be hosting a Worlds Largest Golf Outing Event for the first time and we want to make sure we make a big impact for Wounded Warrior Project® (WWP)! This WLGO event is an 9 hole four person team scramble format. The registration fee includes a $10 per player donation to WWP, green fee, shared cart, warm up bucket, lunch, a WLGO logo'd tote, hat, towel, golf ball and divot tool, local prizes and awards ceremony following play.